After blowing away crowds with their dynamic and heart stopping shows at Soundwave 2015, Finnish classical-metal maestros Apocalyptica will be returning to Australia for a headline tour this September. From bow-eviscerating speed to sprawling, spine-shivering waves of sound, Apocalyptica’s sonic palette is as rich as it is diverse: Metallica covers, Wagnerian tributes alongside international Symphony Orchestras and collaborations with members of Slipknot, Soulfly and Bush are all a part of the bands extensive and multi faceted musical range. With their eighth record 2015’s Shadowmaker , cellists Eicca Toppinen, Paavo Lötjönen, Perttu Kivilaakso and drummer Mikko Sirén delivered an album of deftly weaved intricacies infused with an energy as taut as their horsehair bows. 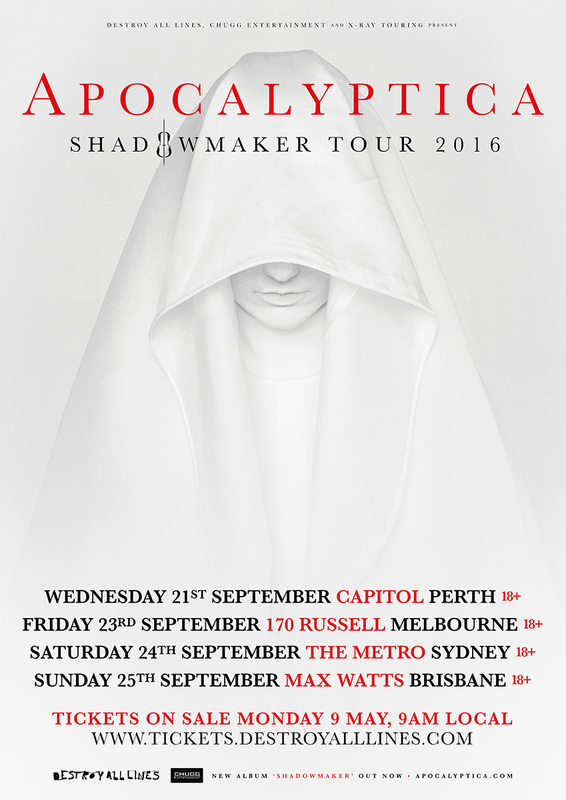 Full-to-bursting with killer choruses, deliciously dark overtones and some good old fashioned pedal-to-the-floor speed metal pace, Shadowmaker slices through every facet of human emotion and leaves the listener overwhelmed.